BetDSI has been in the business since 1998 and over the past 20 years they have earned numerous awards during that period. They are present in almost every country in the world, but they are one of the most famous sportsbooks in the US as well. In this review, we will tackle their offer, odds, withdrawal and deposit methods on their website and give you the complete guide about BetDSI. BetDSI offers several interesting ways of depositing money. Among the standard options, we have credit cards and bank wire transfer, but you can also make a person to person transfer, affiliate transfer, and make a deposit by calling the operator. The limits vary, but we recommend Visa deposits because it is the fastest and cheapest way to make a deposit. Minimum deposit is $99, while maximum is $999. We have to say that BetDSI weakest point is their withdrawal methods. There are only a few options of US bettors and they are not cheap. The best method is paper check, but the fees for it start from $20 and go up. Even though this method is slow and expensive it is the most suitable for the US customers. BetDSI have an interface which looks a bit outdated, but it is certainly functional. However, they are one of the few bookmakers that don’t have a bet slip on the right hand side of the screen. Instead, you have to go through the four-step process in order to bet, which might be frustrating for some of the customers. First, you have to pick a sport you wish to bet on. Secondly, pick one of the spread, point total or money line bets offered. In the third step you can place your wager, and in the final step you have to confirm the bet. BetDSI mobile website is similar to desktop version. Functionality and design are the same, so you won’t have any difficulties if you used BetDSI desktop site already. BetDSI sportsbook odds and limits are within industry standards, there is nothing special about it. Minimum bet is $1, which is great for casual bettors. They offer all the markets interesting to the US bettors, like their competitors. Overall, they are not the best in the business, but their offer is solid, just around the middle of the pack if we compare them with others. BetDSI sportsbook will match your first deposit 50%, up to a maximum of $300. You will have to rollover only your deposit amount ten times, which is different from most of the offers at other bookmaker websites, where you would have to rollover both deposit and bonus amount. 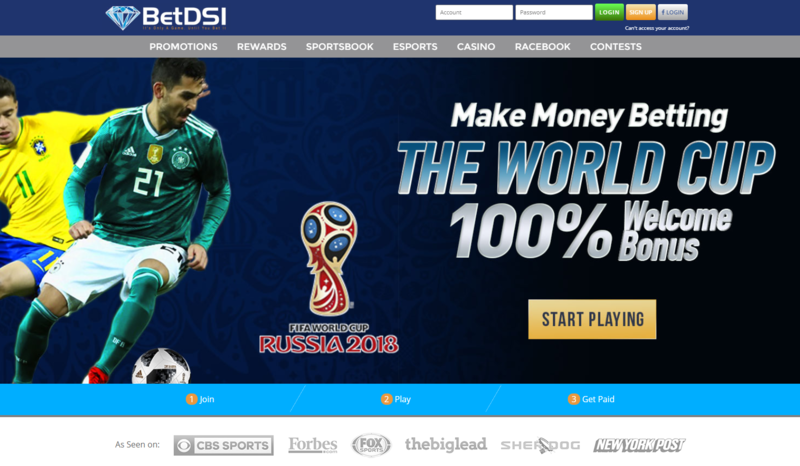 BetDSI is a solid option for the US-based sports bettors. Their welcome bonus is great and easy to claim and it is a main reason why we recommend this operator.